Black Panther consists of a fantastic cast including many standout female roles. In addition to the great acting and writing, the world created inside Black Panther is visually stunning. The film only falls short in its action sequences which are sub-par when it comes to the high standard set by Marvel. When Chadwick Boseman took on the role of King T’Challa in Captain America: Civil War, fans were immediately intrigued by his quiet but powerful charisma. Two years later, this fan-favorite character was given his own individual film with Ryan Coogler’s Black Panther. The film, which succeeds in transporting its audience into a fully fleshed out and beautiful world populated with strong characters, is certainly a quality addition the Marvel Cinematic Universe. The film follows T’Challa as he returns to his homeland of Wakanda, an African nation that keeps its vibranium-powered technology secret from the world. After saving his ex, Nakia (Lupita Nyong’o) and being officially crowned king, he investigates the resurgence of a violent vibranium dealer named Ulysses Klaue (Andy Serkis) and uncovers a plot to reshape the political landscape of the world lead by the mysterious Erik Killmonger (Michael B. Jordan). Aesthetically, Black Panther bears some similarities to James Cameron’s Avatar, with lush tropical environments and a tribal science fiction society. The visual effects used to create the vast kingdom of Wakanda are top notch, fully realizing the unique design and culture of the African nation. 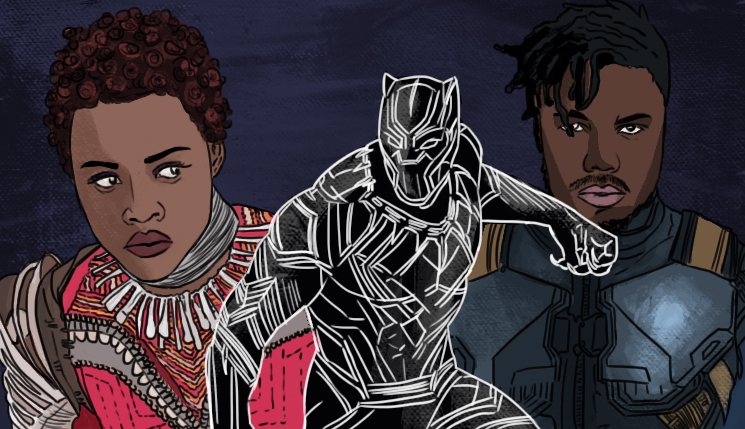 When the physical appearance of the world is accompanied with the rich lore that is implied in the story, Wakanda feels like a real, inhabited place whose various ideologies are visible in the people that populate it. Though scientifically advanced, Wakanda faces many of the difficulties that a modern country would, such as whether or not to admit refugees or interfere with the affairs of other nations. These issues become particularly apparent during T’Challa’s conflict with Killmonger, whose moral ambiguity makes him one of the strongest marvel villains in recent memory. Along with Killmonger and T’Challa, Black Panther boast a wonderful supporting cast, particularly in female characters. Lupita Nyong’o portrays Nakia brilliantly as a character who is strong both emotionally and physically. Alongside Nyong’o are Letitia Wright, who plays T’Challa’s awkward but intelligent sister, and Danai Gurira, who is a force of nature as Wakanda’s captain of the guard. Other standouts include Martin Freeman as a befuddled but good-hearted CIA agent who gets in far over his head when he is brought to Wakanda. Despite the strong focus on Boseman’s T’Challa, every character feels relatable and well rounded. One could have probably written the script from the perspective of any major character and it would be an equally enjoyable enjoyable film. The cast performs well together, both with charming banter and in the more serious moments, remaining constantly engaging. While Black Panther succeeds in most areas, it is brought down in one aspect that Marvel is usually very successful with: the action sequences. The visual effects that make the landscape of Wakanda look so awe-inspiring are vastly overblown once the fighting begins, and there are several shots that feel as if they were part of a cartoon rather than a theatrical movie. With the exception of an epic car chase through the streets of Busan, most of the fights also lack any unique style, and the tribal warfare at the end of the movie is far too short to establish any stakes for the characters other than T’Challa and Killmonger, whose final words to each other are more interesting than the entire scene that precedes them. While Black Panther lags in the quality of its action sequences, it is otherwise a fantastic adventure that balances skillful world-building with a wonderful cast to bring to life one of Marvel’s most unique stories.